Sambil-sambil menyelam duk wat keje opis.. ada gak la duk menyeduk wat kije lain..
as for the title.. im doing.. not me, actually just guiding the owner to do the site.. and the site need extra promote into a google.. site the hosting not very supportive enuf to up the site to the google.. so here it is..
For those yang berminat to do a videography for their wedding. 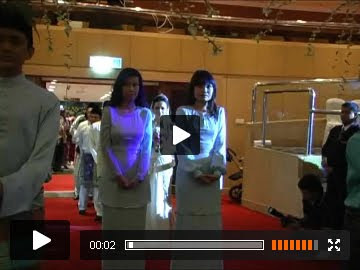 Or need live projection for any of ur big event.. Compile and make a DVD copy of ur wedding and event.. Or u guys have the skill but not yet to afford all the video tools, they also provide Videography equipment rental. 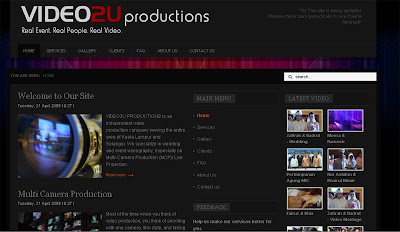 VIDEO2U Production provide affordable and quality video for everyone. Services: Wedding Videos, Wedding Videos, Live Projection / Multi Camera Production, Video Editing, Training/ Promotional Video, Projection Equipment Rentals, Video Format Conversion, DVD/VCD Duplication, Live Internet Streaming, and many more.. Here is the sample of their video editing..